Grasshoppers » Blog Archive » No school uniform! Today it’s world book day,so everybody has dressed up as a character from their favourite book. 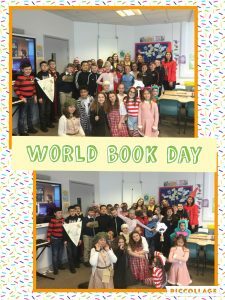 In the afternoon, we did some world book day activities like; word searches,crosswords,quizzes and more! Everyone was a different character and we all had fun. Can you comment which books we are characters from? World book day was amazing!!! Everybody looked great! I loved all our costumes can’t wait until next year!